The 63rd Jio Filmfare Awards saw some amazing look. And being a Bollywood fanatic one cannot miss the glamour and glitz of the red carpet. The A-listed celebs like always drooled everyone with their perfect looks and designer outfits. Even the men looked dapper in their outfits. 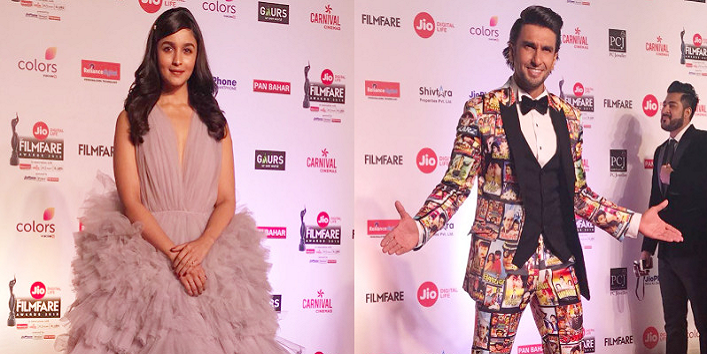 So, without further delays, we present you the best looks from Filmfare Awards 2018. Scroll down and have a look at the best-dressed celebs. The most adorable Student of Bollywood! @aliaabhatt is the prettiest sight at the #JioFilmfareAwards red carpet. Cute actress Alia chose to go dramatic with the ruffles and minimal makeup. No doubt why she is known as the fashionista of Bollywood. For the red carpet look, she chose to wear a black blazer with knee-length pants which looked striking and bold at the same time. One cannot miss the Kajol’s look as she walked the red carpet. She wore a wine-hued gown which looked amazing. Miss World Manushi Chhillar graced the event by wearing a sizzling red dress. As usual Ranveer Singh maintained his quirky avatar and wore an all-printed suit which included the posters of the films from the 80s and 90s. White is right! Shahid carried off this look extremely well. Parineeti looked like a princess in this look. Simple yet stunning look which is definitely the best for the red carpet. So, these were the few best Looks from Filmfare Awards 2018.